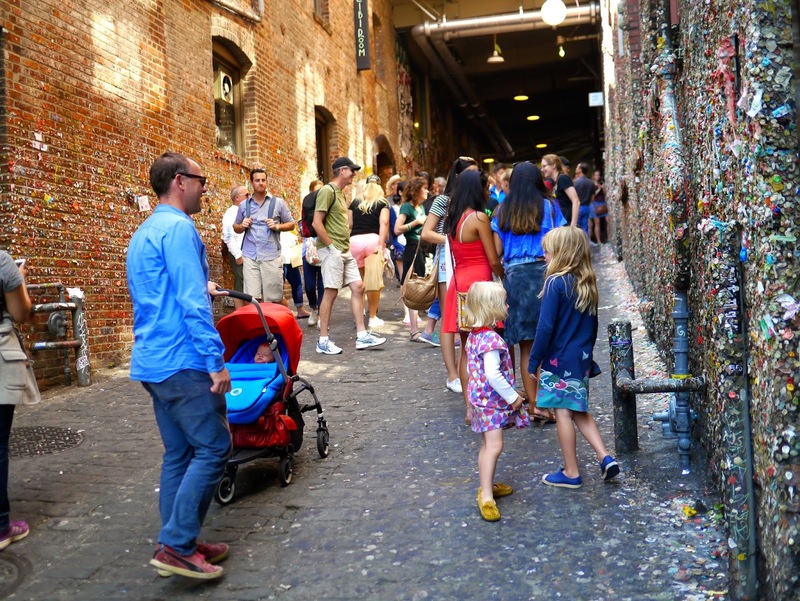 When I first told the girls about the gum wall they were fascinated. They were also completely grossed out by the whole idea, but couldn't wait to see it. 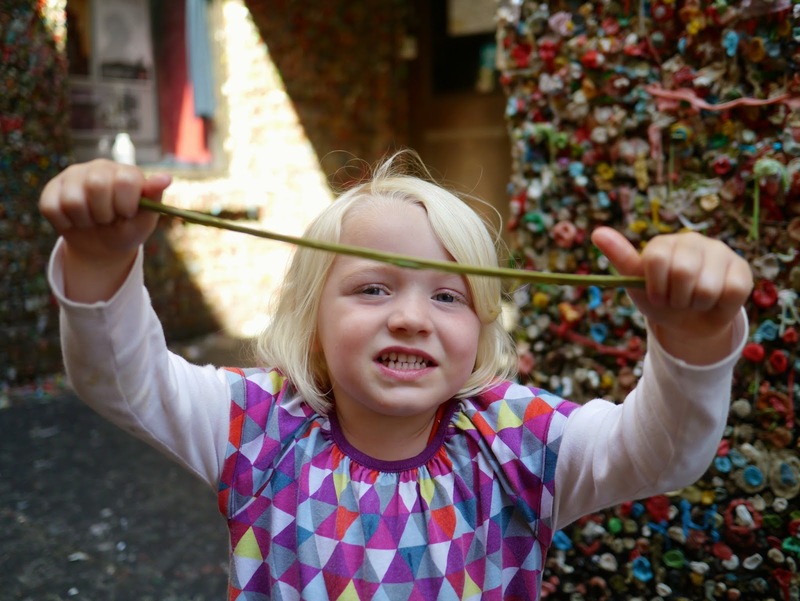 For the last few weeks they've been practicing chewing Hubba Bubba so they'd be pros by the time we made it here. 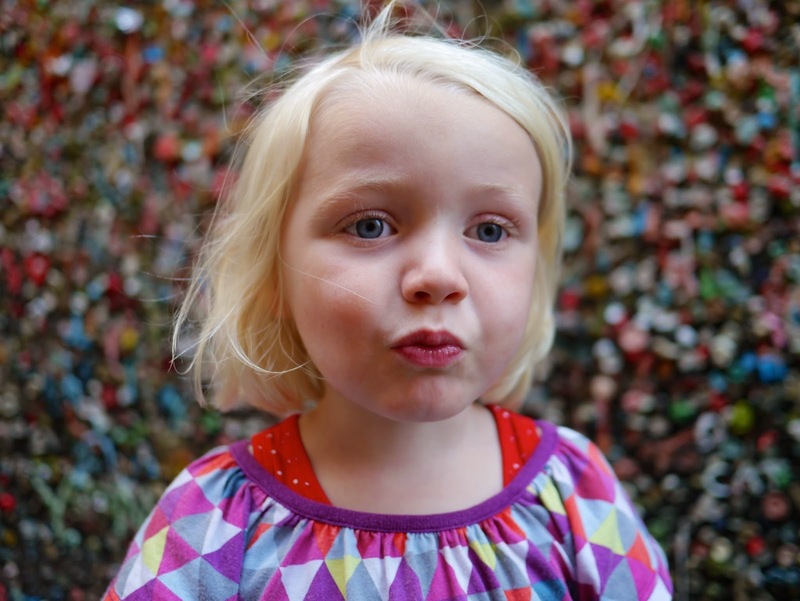 Ava was quite disgusted when she actually saw the wall in person today. 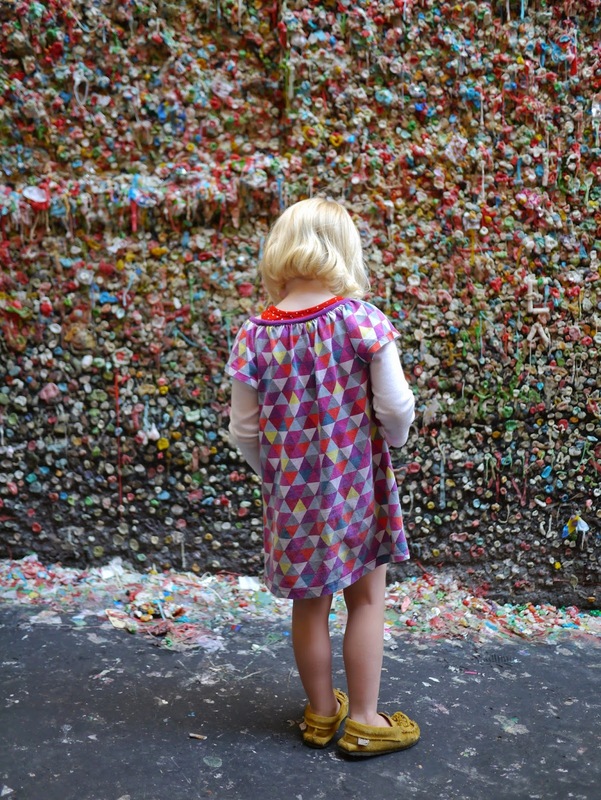 The girls had a pack of bubble gum to add to the wall and Ava chewed hers up super fast so she could get out of there! 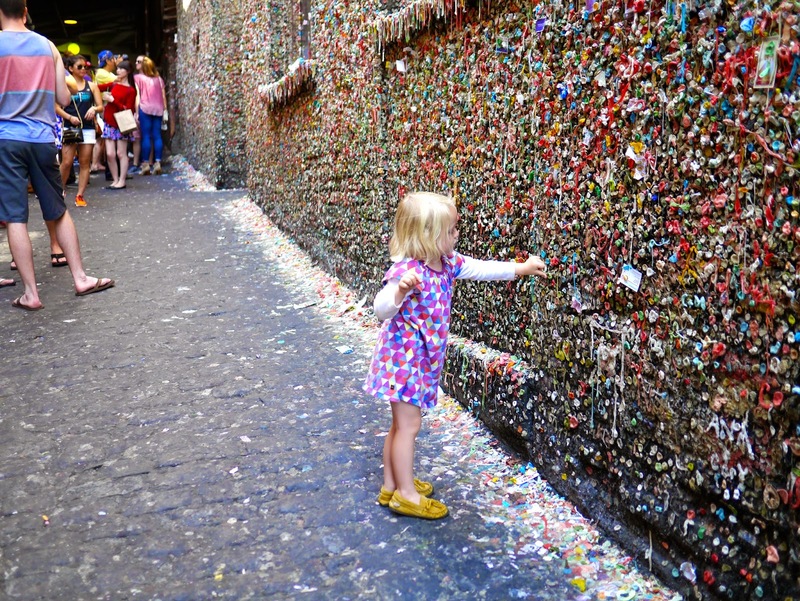 She didn't want to spend a moment longer in the gum encrusted alley way. 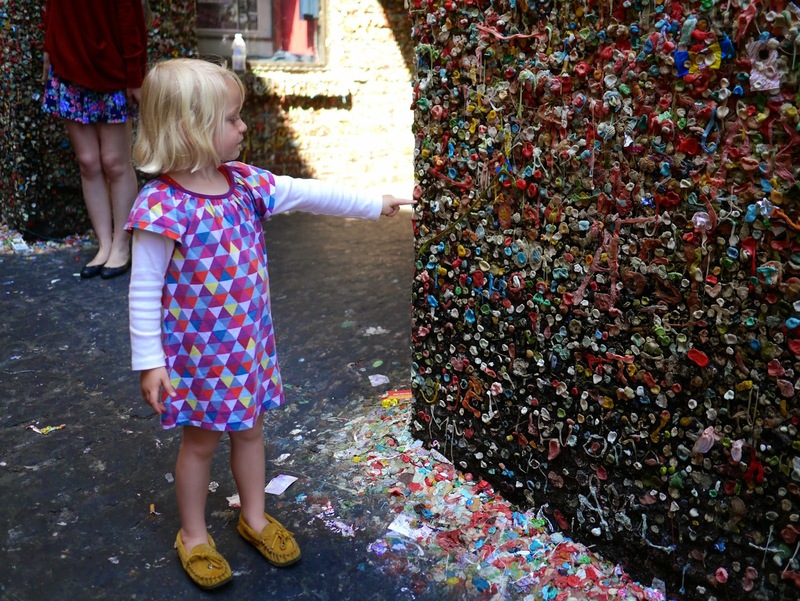 She didn't even like the idea of touching her own gum and ended up using the wrapper to take it out of her mouth and stick it on the wall - before hightailing it back to Kim (who was also grossed out and waited at the end of the alley using Mathilde as an excuse not to get closer to the germ covered wall). Lola however, thought it was absolutely fantastic! 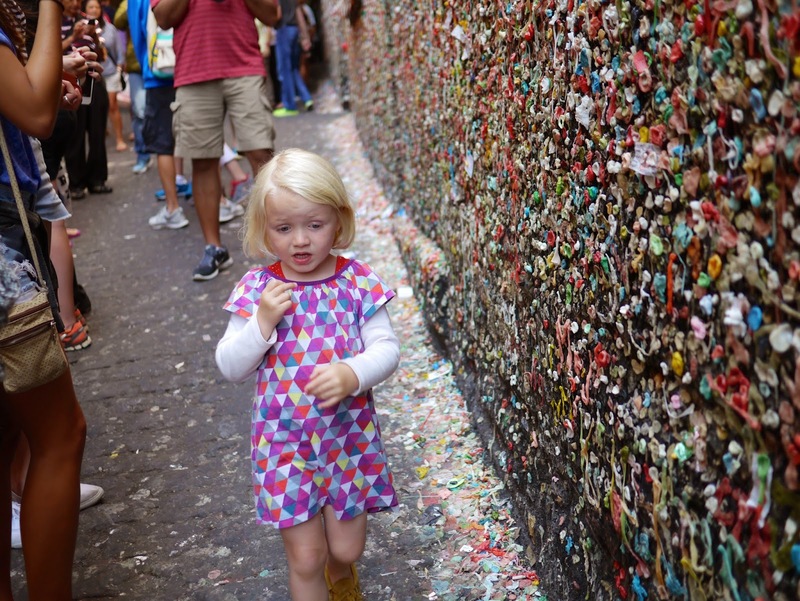 She couldn't get enough of the gum wall. 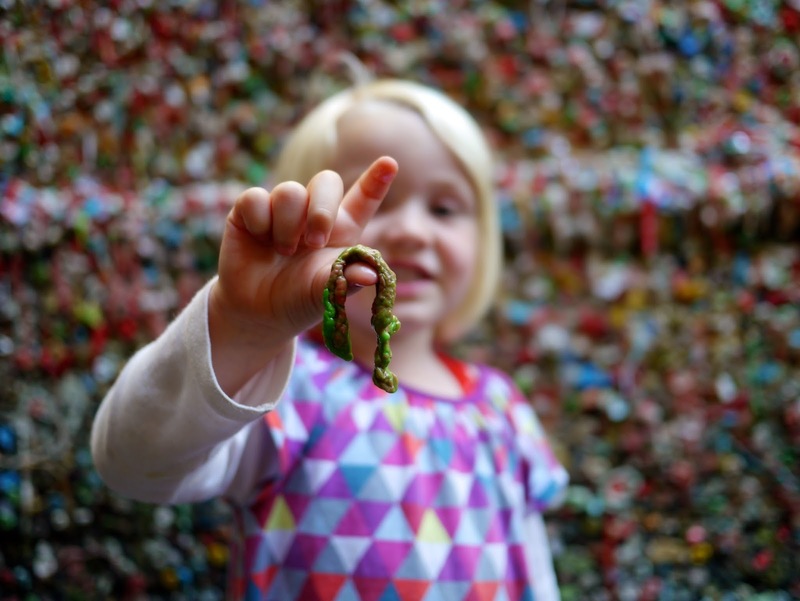 She chewed and chewed her gum until it was soft enough to stretch into long snakes. 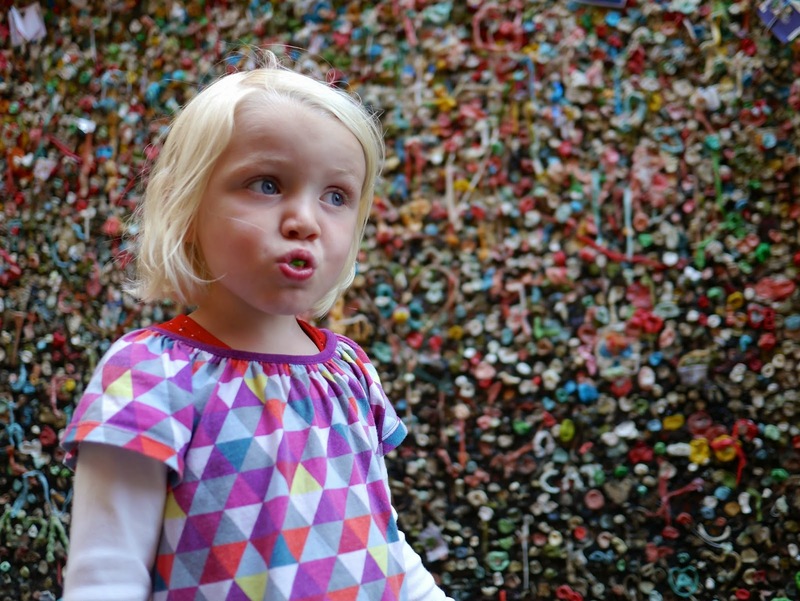 And then she squished them onto the wall. 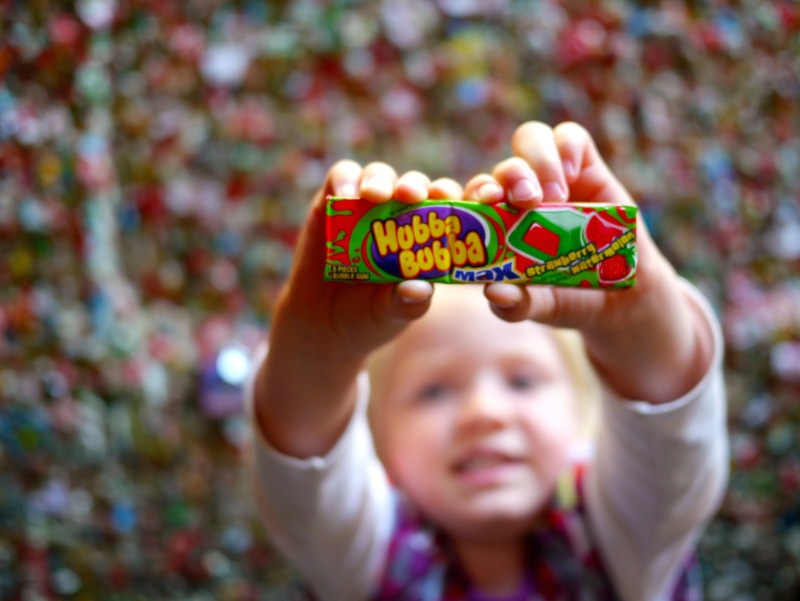 Lola ended up contributing three stretched out pieces of sticky strawberry and watermelon Hubba Bubba to the wall. She was pretty proud of her work! 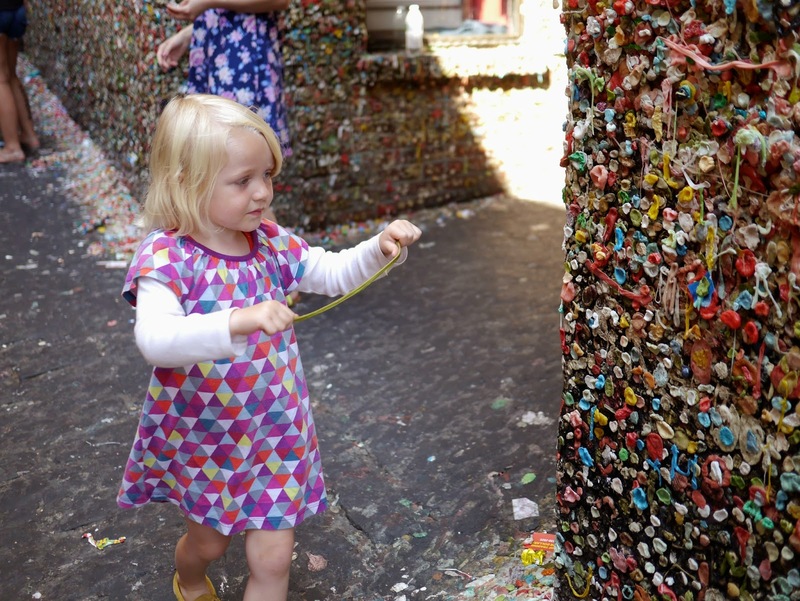 Now, I must admit that I'm not a fan of gum at all. I'm the first person to complain about it on the sidewalk or under bus seats. 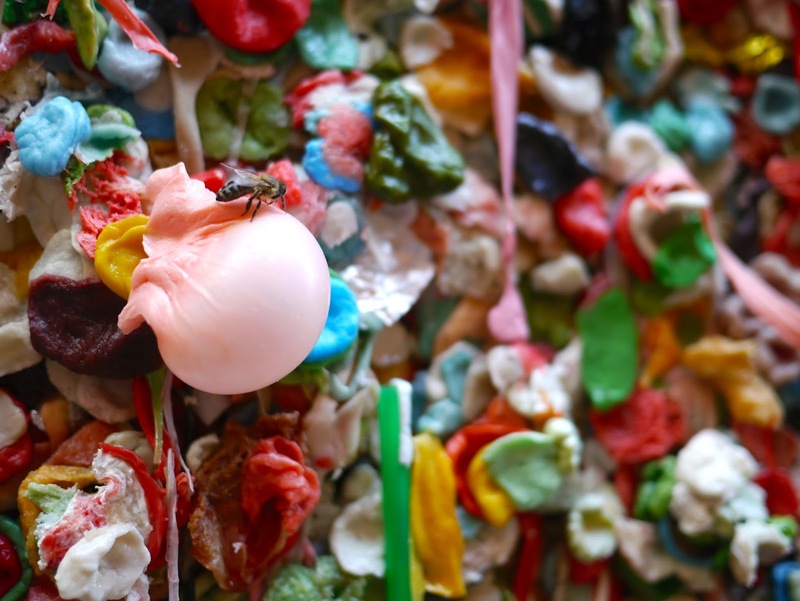 I don't like chewing it myself and I'm not fond of other people chewing it near me, especially if it's loudly (that and scuffing shoes are my biggest pet peeves!). 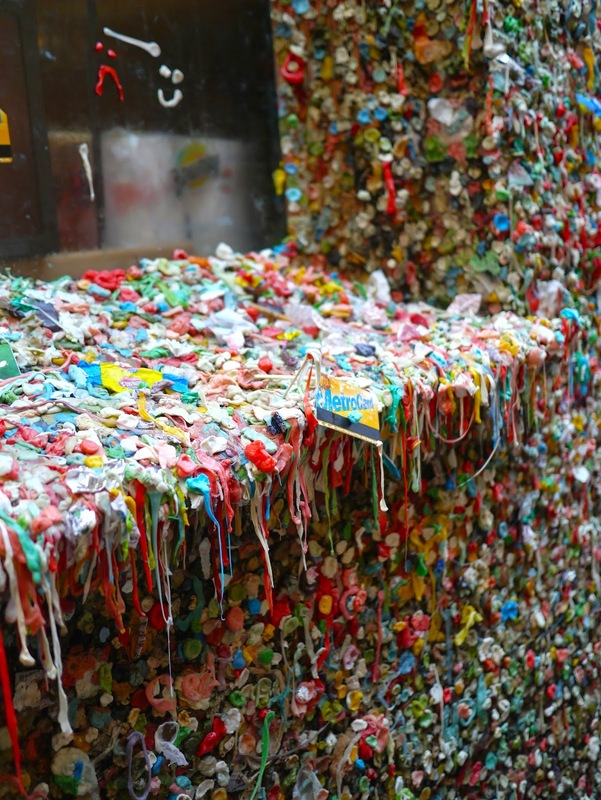 I could easily move to Singapore simply because chewing gum is illegal there! 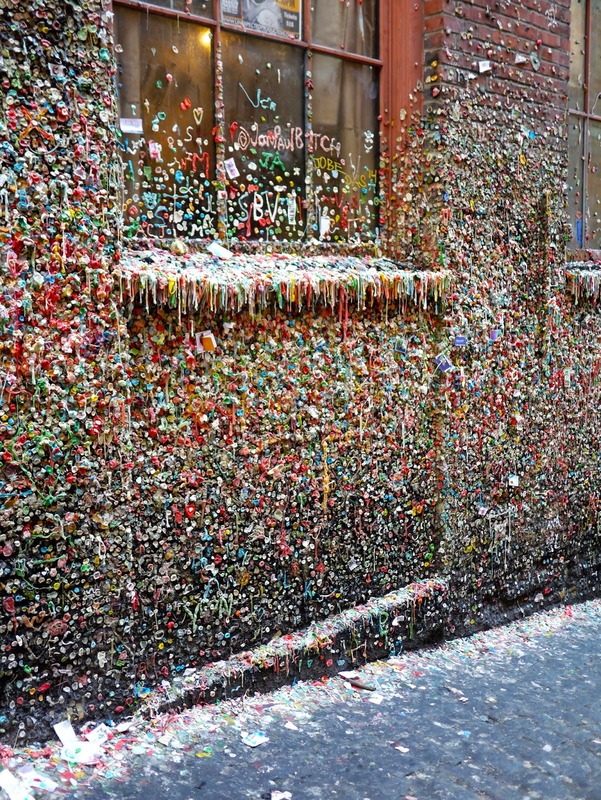 That said, seeing gum en masse like this was pretty amazing. It didn't gross me out as much as I expected. 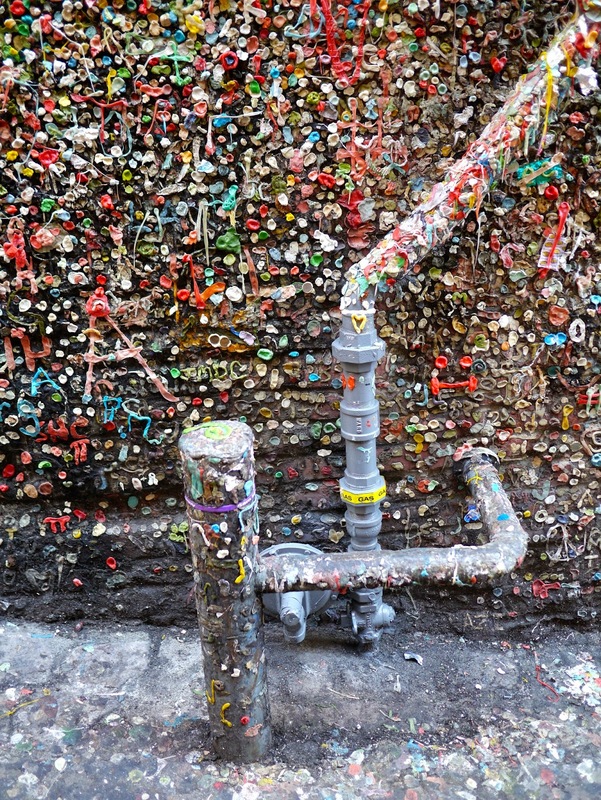 I didn't see blobs of other peoples saliva, I saw the colour and the creativity that went into some of it. 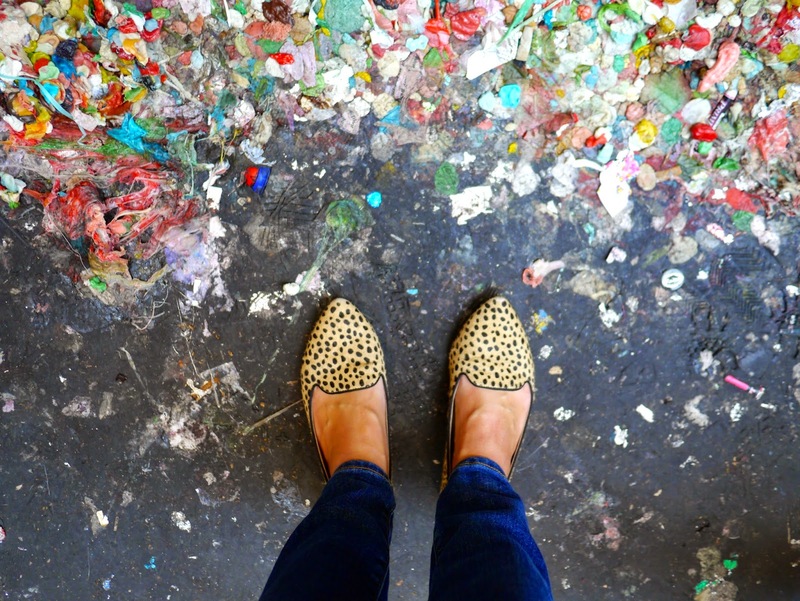 Plus I didn't get any of it stuck to my shoes, and that's always good. 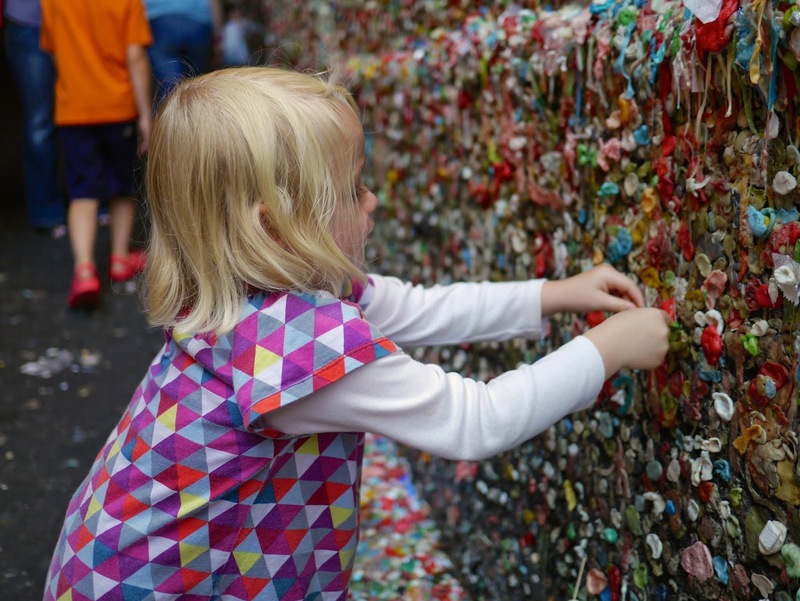 The sweet smell and stickiness of the gum attracts a lot of bees. The whole wall was abuzz with activity. Oh yeah, you can't keep me from a bad pun like that! 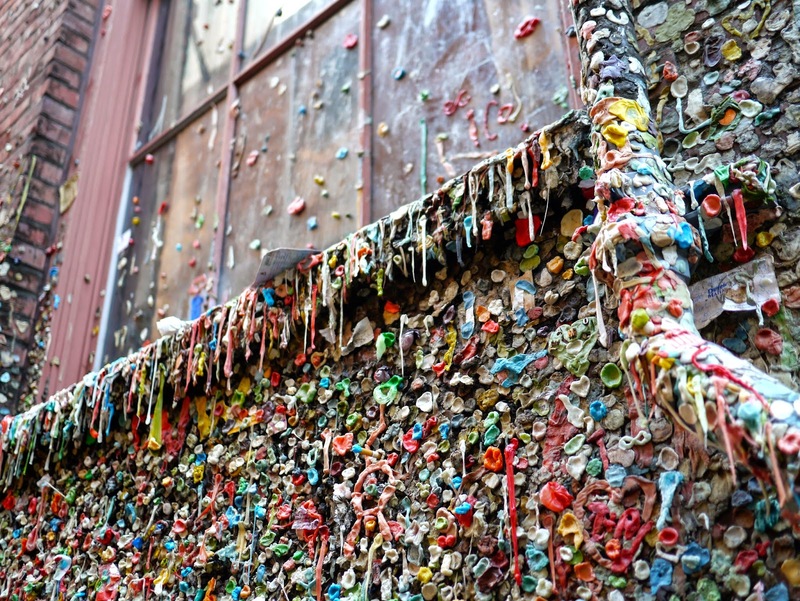 Because it was a pretty hot day there was a lot of gum falling off the wall. And I don't mean individual pieces either. 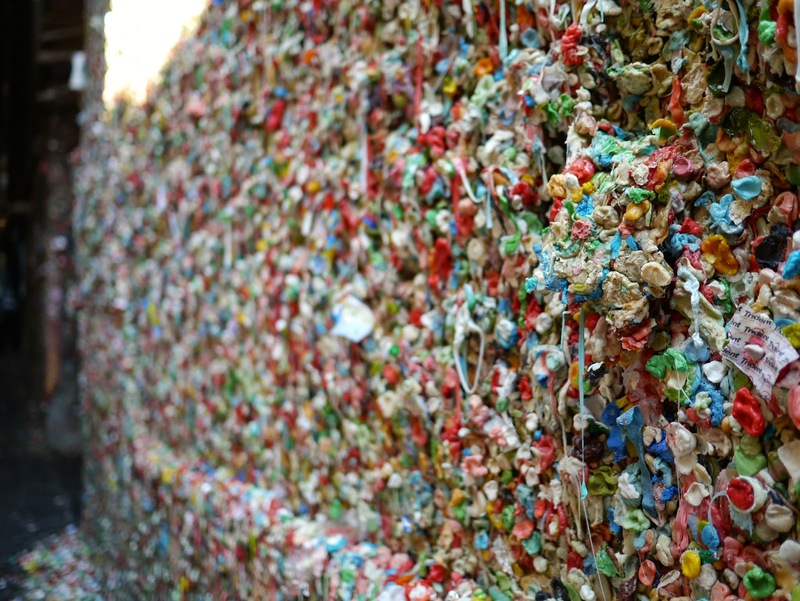 In some spots it was like an avalanche of gum, slowly making it's way down the wall. The huge blob on the righthand side of the next photo fell down while we were next to it. 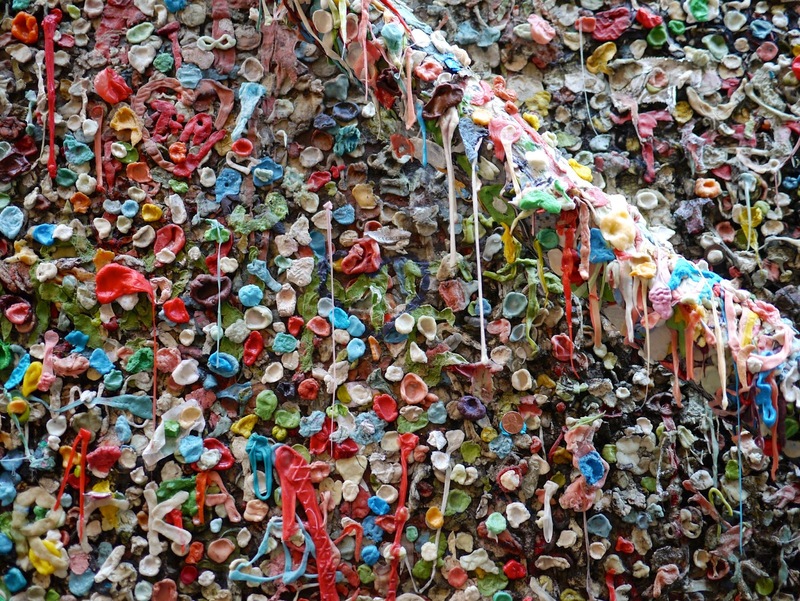 It took a while - maybe a minute or two - but it slowly peeled its way off the wall, collecting more gum as it went. Then it landed with a splat - and we jumped out of the way! 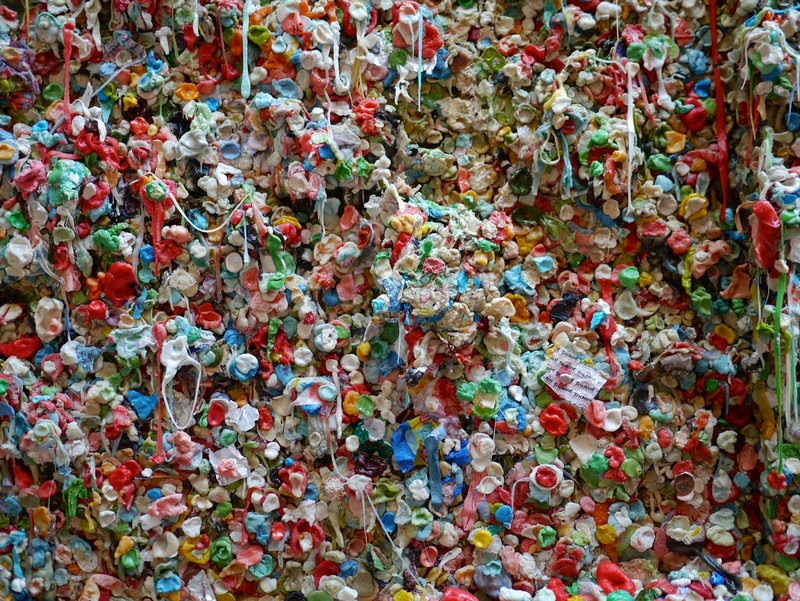 If you're ever in Seattle make sure you check out the gum wall. Sure, it's super gross but it's pretty fascinating too. 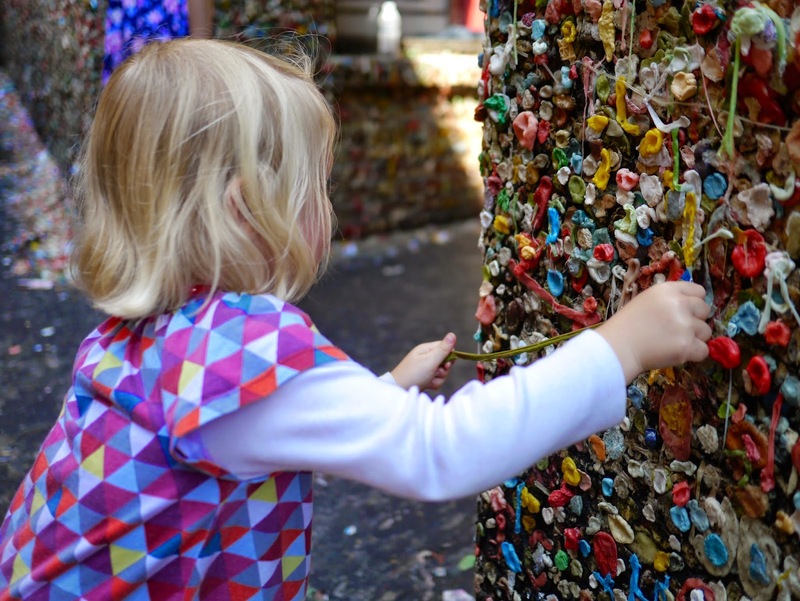 And it's right there next to Pike Place Market so unlike plenty of other obscure tourist attractions you won't need to go out of your way to find it. 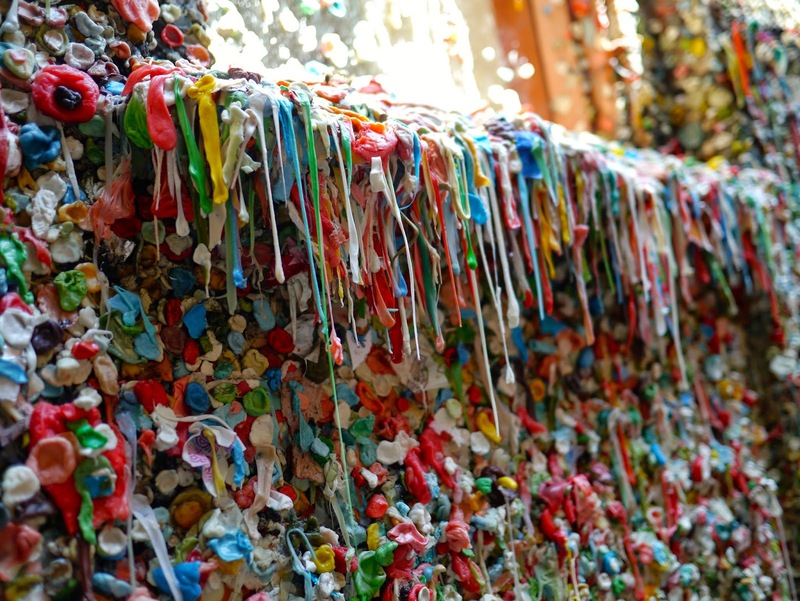 Trust me, you'll smell the sickly sweet smell of bubble gum before you reach it! I've been to Seattle but skipped this one. I think it would have made me gag. Can imagine all that DNA on that wall? It's pretty disgusting, right? But at the same time I'm drawn to all of the colour and the novelty of it! Lola wanted to go there again today when we went to the markets. We gave it a miss though as Ava felt nauseous just seeing the staircase leading down to it. Eeeeewwwwww! That's a lot of slobber in one place :D Did ya whip out the hand sanitiser pronto?